Halved asparagus ends in a pan, bring to the boil and simmer for 15 minutes to extract all the flavor. Strain the flavored stock into a clean pan and discard the bits left in the sieve. Keep hot over a low heat. Cut the tips (about 3cm long) off the asparagus spears and set to one side. Roughly chop the stalks, drop them into a pan of lightly salted water and cook for 6-8 minutes until very tender. Lift out with a slotted spoon into a colander, drain well, then tip into a food processor and blend to a smooth purée. Set aside. Drop the asparagus tips into the boiling water and cook for 2-3 minutes until just tender. Drain, refresh under cold water, then dry well on kitchen paper. Heat the oil and butter in a medium-size pan, add the shallots and stir over a medium heat for 5-6 minutes until soft but not browned. Add the rice and stir well until all the grains are coated in the oil and butter. Add the white wine and simmer gently, stirring, until it has been absorbed. Add a ladleful of the hot stock and stir until all the stock has been absorbed before adding another ladleful. Continue this way for about 20-25 minutes, stirring frequently, until the rice is creamy and tender, but still has a little bit of bite. You might not need to use all the stock. Shortly before the risotto is cooked, finely chop the mint leaves (don’t chop them sooner or the pieces will turn black at the edges). 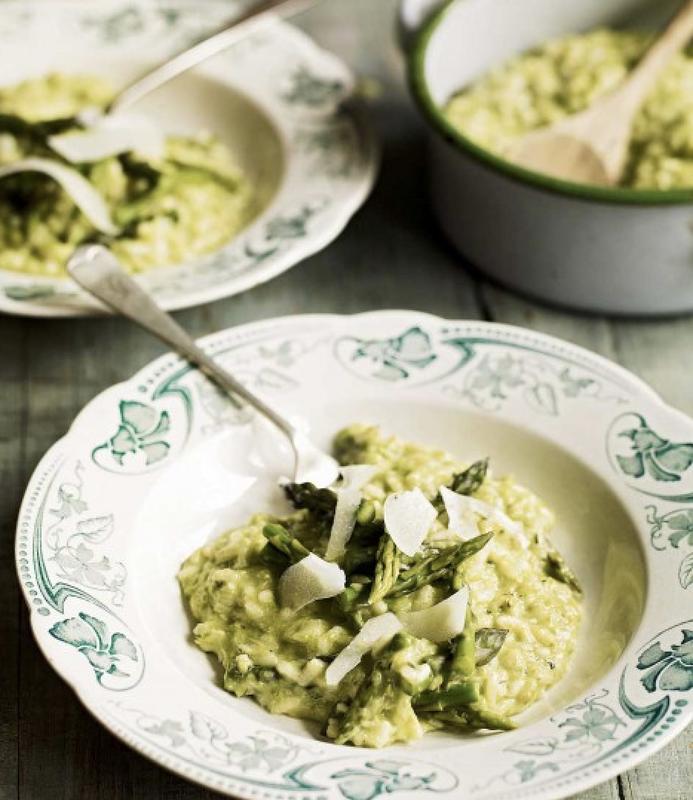 Stir the asparagus purée into the risotto with the cream, lemon zest, mint and pecorino, followed by three-quarters of the asparagus tips. Spoon the risotto into warmed deep plates, scatter the rest of the tips on top of each plate and shave over a little more pecorino to serve.